I posted this meme this past week on social media about your example vs your opinion. Once again, I received more engagement with this post than I ever have. Just on FB alone, I shared it on my own page, business page and some other groups I’m in and I had almost 150 shares. I’m starting to pay attention to this. It indicates to me with that many shares and many likes/loves, this topic really resonates with lots of people. To me it’s important if we’re voicing our opinion about anything, to be aware it is just that. Our opinion. An opinion is formed by living life. Each of us come from different backgrounds and experiences don’t we? We all may have similar opinions or very different opinions, due to many choices we’ve made throughout our lives. I’m reminded of the Universal Law of Relativity. It’s all relative and our thoughts and experiences about something, make it relative. You may have an opinion about how cold is cold inside your home. Your spouse or loved one may have another opinion about what temperature to keep your home at in order for it to feel warm and comfortable. You relate one thing to another to form your opinion. Are you following me? What this tells me is, as I am or you are, truly coming from a place of kindness, love, joy, appreciation and compassion, you’re setting a good example. When you really stop and pay attention to what you’re thoughts and feelings are throughout your day, you will be able to adjust them if you’re not coming from a place that would be a good example out in your world. Our opinions come from our sum total of our experiences throughout our lives. If you know that your opinion is different than someone else you work with or live with, you can take a look at what those differences may be in a way that won’t hurt you or the other person. Find a compromise. Then by your example, you’re showing those around you that things can come to a conclusion that may benefit you and also the other person. When you simply get stuck on only living from your own opinion, you’re disregarding the other person. I do not talk about politics very often. Only as all of you know, our nation is at a stand still right now. I sincerely wish they would come to a compromise and think about our entire nation instead of politics. Both sides. Many people responded to my meme above. Could this be one of the reasons why? I feel so many of us get this. What is going on is affecting all of us. One thing is for sure, as each of us take responsibility for ourselves , where we are coming from and what we are putting off in our own lives every day, and set the best example we can, our world will change. I would love to hear from you. Reach out to me via email or if you’re reading this within my blog on my site, please leave me a comment with your thoughts. 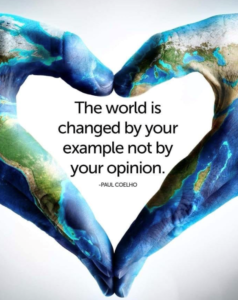 Maybe share with me how you’ve been a good example consciously for our world. PS. I’m sharing the Emotional Scale with you again. 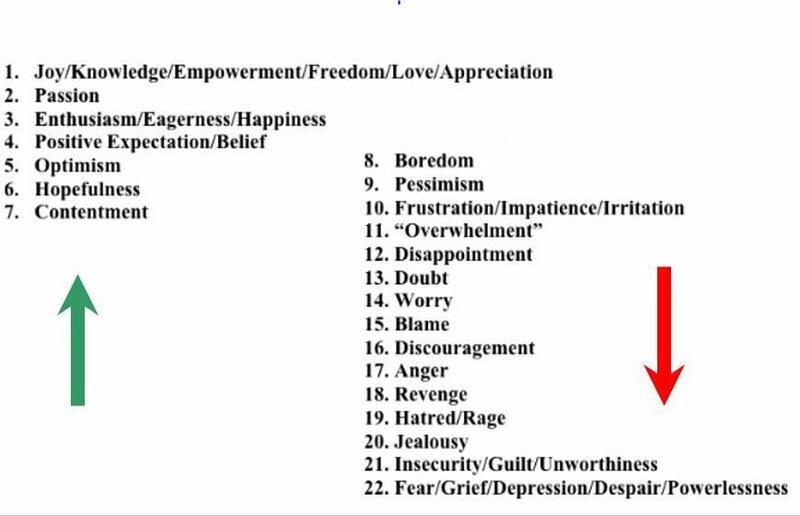 Maybe you’re a visual person like myself and need a reminder each day of where you’re at on this scale.